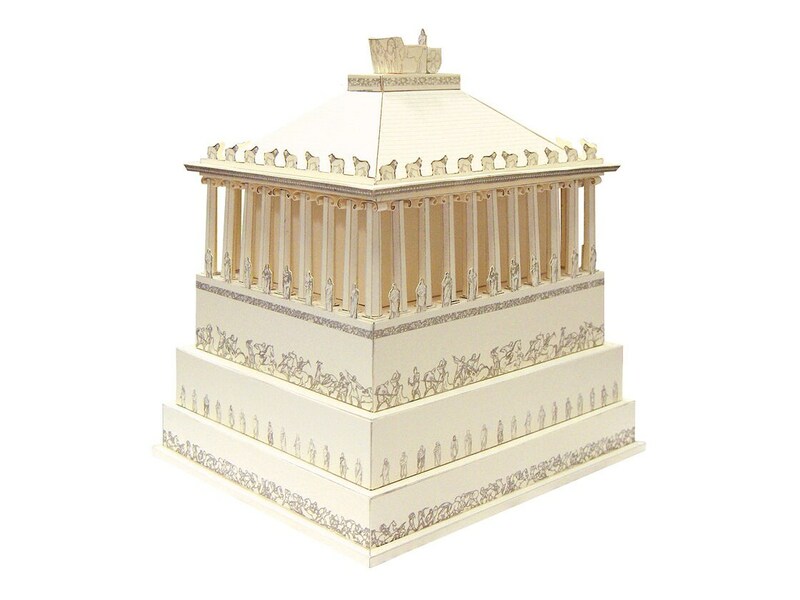 The Mausoleum at Halicarnassus was a tomb built between 353 and 350 BC at Halicarnassus (present Bodrum, Turkey) for Mausolus, a satrap in the Persian Empire, and Artemisia II of Caria. The structure was designed by the Greek architects Satyros and Pythius of Priene. The Mausoleum was approximately 45 m (148 ft) in height, and the four sides were adorned with sculptural reliefs, each created by one of four Greek sculptors—Leochares, Bryaxis, Scopas of Paros and Timotheus. The finished structure of the mausoleum was considered to be such an aesthetic triumph that Antipater of Sidon identified it as one of his Seven Wonders of the Ancient World. It was destroyed by successive earthquakes from the 12th to the 15th century. The word mausoleum has now come to be used generically for an above-ground tomb. 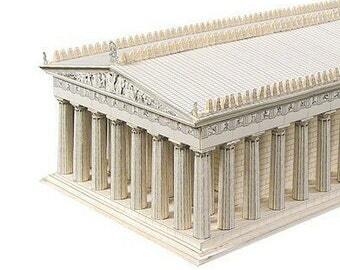 This detailed model is a possible reconstruction of what this huge structure may have once looked like. PRINTED KIT - this paper model is delivered unassembled, in a flat kit with all the necessary details printed on sturdy paper sheets. You will need to cut, fold and glue the details according to the set-up instructions. 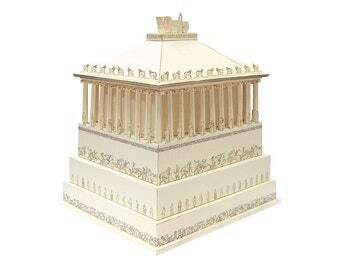 PRE-CUT KIT - this paper model is delivered unassembled, in a flat kit with all the necessary details pre-cut. You will need to fold and glue the details according to the set-up instructions. 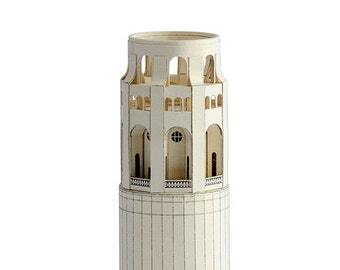 Browse our shop to find more architecture inspired paper building kits and school supplies for scale modelling. Interested in 3D print models? You may find our paper models helpful for studies of form and shape. Tolle Brückennachbildung, die sehr gut durch das Material vorbereitet wird. Das Zusammenbauen macht Freude.